A two-minute power pose can help boost your performance, whether it is to excel in a job interview, nail a presentation or get leverage in critical negotiations, according to Harvard professor and social psychologist Amy Cuddy. And this is not mere wishful thinking; she has the science to prove it. Her 2012 TED talk on the topic has been viewed more than 31 million times – and is the speaker circuit’s second most popular video of all time. In the talk, Cuddy asked the audience to take two minutes in private to strike a “power pose” before entering into a high-stakes situation to improve their confidence and chances for success. Her research shows that our body language not only affects how others see us, but how we see ourselves. By holding our bodies in a position of power, our hormones react immediately — our testosterone goes up and our cortisol goes down — resulting in calm confidence that we feel and others experience. Power posing is just one aspect of what she calls “presence,” the subject of her new book, Presence: Bringing Your Boldest Self to Your Biggest Challenges. In the following excerpt from the book, Cuddy explains what led her on the path to writing the book and why it’s critical to “fake it until we make it,” or better yet, until we become it. This kind of interaction happens far more frequently than I’d ever have imagined: a stranger shares a personal story about successfully coping with a big challenge and then simply thanks me for my part in it. They’re women and men, old and young, timid and gregarious, struggling and wealthy. But something binds them: all have felt powerless in the face of great pressure and anxiety, and all discovered a remarkably simple way to liberate themselves from that feeling of powerlessness. I get a little teary every time I hear from one of them. For most authors, the book comes first, then the responses. For me, it was the other way around. First I wrote some scholarly articles, which no one (well, hardly anyone) ever read; they inspired a talk I delivered at the TEDGlobal Conference in 2012. In it, I discussed research I had done that yielded an odd and unexpected finding about how our bodies influence our brains. As a result of this research, I was able to describe a technique — that Wonder Woman–in‑the‑bathroom thing Fetaine mentioned … that can quickly increase our confidence and decrease our anxiety in challenging situations. I didn’t know whether the topic would resonate with people. It surely spoke to me. Immediately after the 21‑minute video of the talk was posted on the Internet, I began hearing from people who had seen it. Of course, my speech didn’t magically give Fetaine the knowledge she needed to do well on the MCAT. She didn’t miraculously acquire a detailed understanding of the characteristics of smooth‑strain versus rough‑strain bacteria or how the work-energy theorem relates to changes in kinetic energy. But it may have released her from the fear that could have prevented her from expressing the things she knew. Powerlessness engulfs us — and all that we believe, know, and feel. It enshrouds who we are, making us invisible. It even alienates us from ourselves. The opposite of powerlessness must be power, right? In a sense that’s true, but it’s not as simple as that. The research I’ve been doing for years now joins a large body of inquiry into a condition I call presence. Presence stems from believing in and trusting yourself — your real, honest feelings, values, and abilities. That’s important, because if you don’t trust yourself, how can others trust you? Whether we are talking in front of two people or five thousand, interviewing for a job, negotiating for a raise, or pitching a business idea to potential investors, speaking up for ourselves or speaking up for someone else, we all face daunting moments that must be met with poise if we want to feel good about ourselves and make progress in our lives. Presence gives us the power to rise to these moments. The path that brought me to that talk and this breakthrough was roundabout, to say the least. But it’s clear where it started. What I most remember were the silly drawings and sweet notes on the whiteboard, left by my friends. I’m a sophomore in college. I wake up in a hospital room. I look around — cards everywhere, and flowers. I’m exhausted. But I’m also anxious and agitated. I can barely keep my eyes open. I’ve never felt like this. I don’t understand, but I don’t have the energy to try to make sense of it. I fall asleep. My last clear memory before waking up in that hospital was of traveling from Missoula, Montana, to Boulder, Colorado, with two of my good friends and housemates. We’d gone up to Missoula to help organize a conference with University of Montana students and to visit with friends. We left Missoula in the early evening, around six, on a Sunday. We were trying to get back to Boulder for morning classes. In retrospect, especially as a parent, I now see how incredibly stupid this was, given that the drive time between Missoula and Boulder is thirteen to fourteen hours. But we were nineteen. We had what we thought was a good plan: we would each drive a third of the trip; one passenger would stay up to help the driver stay awake and alert while the other passenger would sleep in the back of the Jeep Cherokee, seats down, in a sleeping bag. I drove my shift; I think I went first. Then I was the active passenger, keeping an eye on the driver. And it was a really nice memory. Really peaceful. I loved these people I was with. I loved the openness of the West. I loved the wilderness. No headlights to count on the highway. Just us. Then came my turn to sleep in the backseat. As I learned later, here’s what happened next. My friend was driving the worst shift. It was the time of night when you feel as though you might be the only person in the entire world who is awake. Not only was it the middle of the night, it was the middle of the night in the middle of Wyoming. Very dark, very open, very lonesome. Very little to keep you awake. At around four in the morning, my friend fell asleep. She nodded off, veered, and hit the rumble strip. That woke her up, and she overcorrected. The car rolled three and a half times, landing on its roof. My friends in the front seat were wearing their seatbelts. I, who had been sleeping in back with the seats down, was ejected from the car and thrown into the night. The right‑front side of my head slammed into the highway. The rest of me remained in the sleeping bag. I sustained a traumatic brain injury. More specifically, I suffered a diffuse axonal injury (DAI). In a DAI, the brain is subjected to “shearing forces,” usually from severe rotational acceleration, which is quite common in car accidents. Imagine what happens during a high‑speed car crash: with the sudden and extreme change in velocity upon impact, your body abruptly stops but your brain continues to move and sometimes even rotate within the skull, which it is not meant to do, and even bangs back and forth against your skull, which it is also not meant to do. The force of my head slamming into the highway, which fractured my skull, didn’t help matters. The brain is meant to exist in a safe space, protected by the skull and cushioned by several thin membranes, called meninges, and cerebrospinal fluid. The skull is the brain’s friend, but the two are never intended to touch. The shearing forces of a severe head injury tear and stretch neurons and their fibers (axons) throughout the brain. Like electrical wires, axons are insulated by a protective coating, or buffer, called the myelin sheath. Even if an axon isn’t severed, damage to the myelin sheath can significantly slow the speed at which information travels from neuron to neuron. In a DAI, the injury occurs throughout the brain, unlike a focal brain injury, such as a gunshot wound, where damage strikes a very specific location. Everything the brain does depends on neurons communicating; when neurons throughout the brain are damaged, their communication is inevitably damaged as well. So when you have a DAI, no doctor is going to tell you, “Well, the damage is to your motor area, so you’re going to have trouble with movement.” Or “It’s your speech area; you’re going to have difficulty producing and processing speech.” They won’t know if you’ll recover, how well you’ll recover, or which brain functions will be affected: Will your memory be impaired? Your emotions? Your spatial reasoning? Your small-motor skills? Given how little we understand about DAIs, the likelihood that a doctor can offer an accurate prognosis is dismal. After a DAI, you are a different person. In many ways. How you think, how you feel, how you express yourself, respond, interact — all of these dimensions are affected. On top of that, your ability to understand yourself has probably taken a hit, so you’re not really in a position to know exactly how you’ve changed. And no one — no one — can tell you what to expect. Okay, so there I was in the hospital. Naturally, I had been withdrawn from college, and my doctors expressed serious doubts about whether I would ever be cognitively fit to return. Given the severity of my injury and statistics on people with similar injuries, they said: Don’t expect to finish college. You’re going to be fine — “high functioning” — but you should probably find something else to do. I learned that my IQ had dropped thirty points — two standard deviations. I knew this not because a doctor had explained it to me. I knew because the IQ was part of a two‑day battery of neuropsychology tests they’d given me, and I’d received a long report that included that result. The doctors didn’t think it was important to explain this to me. Did they think I wasn’t intelligent enough to understand? Or that it wasn’t important enough? I don’t want to give the IQ more credit than it deserves; I’m not making any claims about its ability to predict life outcomes. But it was something that I believed quantified my intelligence. So, according to the doctors, I was no longer smart, and I felt this acutely. I received occupational therapy, cognitive therapy, speech therapy, physical therapy, psychological counseling. About six months after the accident, when I was home for the summer, a couple of my closest friends, who’d noticeably pulled away from me, told me, “You’re just not the same anymore.” How could two of the people who seemed to understand me the best tell me I was no longer myself? How was I different? They couldn’t see me, and I couldn’t see myself. A head injury makes you feel confused, anxious, and frustrated. When your doctors tell you they don’t know what you should expect, and your friends tell you that you’re different, it certainly amplifies all that confusion, anxiety, and frustration. I spent the next year in a fog — anxious, disoriented, making bad decisions, not sure what I would do next. After that, I went back to school. But it was too soon. I couldn’t think. I couldn’t adequately process spoken information. It was like I was listening to someone speaking half in a language I knew and half in a language I didn’t know, which only made me more frustrated and anxious. I had to drop out because I was failing my classes. Although I’d broken many bones in the accident, I looked physically whole. And because traumatic brain injuries are often invisible to others, people said, “Wow, you’re so lucky! You could have broken your neck!” Then I felt guilty and ashamed for being frustrated by this response. Our way of thinking, our intellect, our affect, our personality — these aren’t things we expect will ever change. We take them for granted. We fear having an accident that will make us paralyzed, change our ability to move around, or cause us to lose our hearing or sight. But we don’t think about having an accident that will cause us to lose ourselves. For many years after the head injury, I felt like I was passing as my former self . . . although I didn’t really know who that former self was. I felt like an impostor, an impostor in my own body. I had to relearn how to learn. I kept trying to start school again because I couldn’t accept people telling me that I couldn’t do it. Telling me I can’t finish college? You’re just asking for it. I had to study circles around others. Eventually, to my unspeakable relief, my mental clarity began to return. It took two more tries before it finally stuck. I finished college four years after my pre‑accident classmates. One of the reasons I persisted was that I’d found something I liked to study: psychology. After college, I managed to enter a profession that required a fully functioning brain. As Anatole France wrote, “All changes . . . have their melancholy; for what we leave behind us is a part of ourselves; we must die to one life before we can enter another.” Along the way, not surprisingly, I became a person for whom all these questions of presence and power, of confidence and doubt, took on a great deal of significance. My injury led me to study the science of presence, but it was my TED talk that made me realize just how universal the yearning for it is. Because here’s the thing: most people are dealing with stressful challenges every day. People in every corner of the world and in all walks of life are trying to work up the nerve to speak in class, to interview for a job, to audition for a role, to confront a daily hardship, to stand up for what they believe in, or to just find peace being who they are. This is true of people who are homeless and people who are by traditional standards wildly successful. Victims of bullying and prejudice and sexual assault, political refugees, people dealing with mental illness or who have suffered grave injuries — all of them face these challenges. And so do all the people working to help those people — the parents, spouses, children, counselors, doctors, colleagues, and friends of those who are struggling. It’s hard for me to even explain without getting a little choked up. All these people — the vast majority of whom are not scientists — have forced me to look at my own research in a new way: they simultaneously take me away from the science and bring me closer to it. Hearing their stories, I became obliged to think about how social science findings actually play out in the real world. I started to care about doing research that changes lives in a positive way. But I also started coming up with basic questions that may never have occurred to me if I’d stayed inside the lab and steeped myself in the literature. In the beginning I was overwhelmed by the response to the TED talk and by the sense that I might have made a big mistake in sharing my research and my personal story. I had no expectation that so many strangers would watch it and no idea how incredibly vulnerable and exposed I’d feel. It’s what happens to anyone whom the Internet scoops up and then blasts all over the world all at once. Some people will recognize you in public. But mostly I feel incredibly lucky — lucky to have had a chance to share this research and my story with so many people, and even luckier to have so many of those people share their stories with me. I love academia, but I find so much inspiration outside the lab and the classroom. One of the nice things about being at Harvard Business School is that I am encouraged to cross that researcher-practitioner divide, so I had already started talking to people in organizations about how research is applied, what’s working, where the kinks are, and things like that. But I didn’t anticipate how this enormous world of thoughtful people would open up to me after the TED talk was posted. I love these people and I feel very connected and loyal to them. I want to honor them, to honor their willingness to try — to keep getting back in the saddle or to help other people keep trying — and their willingness to sit down and write about their struggles in an email to me, a stranger. Or to tell me about it in an airport, or a bookstore-café. Now I see how a talk can work like a song — how people personalize it, connect with it, feel validated knowing that someone else has felt as they feel. As Dave Grohl once said, “That’s one of the great things about music: you can sing a song to 85,000 people and they’ll sing it back for 85,000 different reasons.” I was speaking at a youth homeless shelter and asked the residents to tell me about the situations they found most stressful. One teenager said, “Showing up at the doorstep of this shelter.” At another shelter, a woman said, “Calling to ask for services or help or support. I know I’m going to wait a long time, and then the person on the other end will be rude and judgmental.” To this, another woman at the shelter responded, “That’s funny, because I used to work in a call center, and I was going to say, ‘Taking calls from people who you know are going to be frustrated and angry, who’ve been waiting a long time while I’m trying to manage a thousand other incoming calls.’” Exactly. All the responses I’ve gotten to the TED talk were an unanticipated gift, because they helped me better understand how and why this research resonates. In short: the stories helped me understand how to write Presence and motivated me to do it. 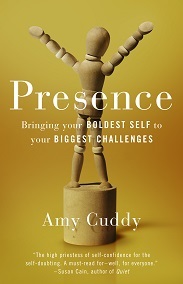 Excerpted from the book Presence, by Amy Cuddy. Copyright © 2015 by Amy Cuddy. Reprinted with permission of Little, Brown and Company. The subject of poseurs, and the photo in the masthead, remind me of Martin Shkreli. There is a dark side of “presence stems from believing in and trusting yourself — your real, honest feelings, values, and abilities” that Ms. Cuddy doesn’t seem to explore or even acknowledge here. But I think she would agree that self-esteem without empathy and humility is worthless.